A red Honda Civic in a ditch and brush between Interstate 90 and the Continental Towers parking lot near Golf Road, south of New Wilke Road (See more photos …). Rolling Meadows police responded about 12:22 p.m. to a report of a one-car crash near Interstate 90, just west of the southwest corner of the Continental Towers parking lot, 1701 Golf Road. Police received a report that a vehicle may have crashed off of Interstate 90. Police arrived within a minute and discovered a red Honda Civic in a ditch in tall cattails between Interstate 90 and the edge of the parking lot. A fence was damaged near the end of the driveway at the southwest corner of the lot that connects Golf Road to the parking lot. 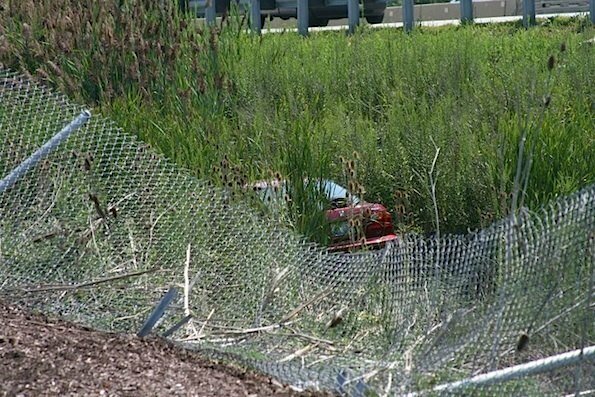 The fence appeared as though it may have been run over by the vehicle traveling into the ditch. Tire tracks also appeared in the parking lot shoulder material from the parking lot to the ditch where the car was located. Police did not comment at the scene. No occupants were found in the vehicle. The vehicle matched a description of a vehicle reported missing yesterday with a missing person report from Arlington Heights yesterday. A woman in her eighties was reported missing yesterday. Police were on the lookout for the woman yesterday and today. Police discovered a victim at the crash site by about 12:29 p.m. — apparently outside of the car. Paramedics were immediately called to the scene, but left the scene without transportation of a victim. Police immediately taped off the scene with yellow tape, and several detectives from Rolling Meadows Police Department and Arlington Heights Police Department arrived within several minutes. A Rolling Meadows Command Van also parked near the scene. A woman was reported missing yesterday at about 6:20 p.m. A relative reported that the missing woman in her eighties left her home with windows and doors open, and that she was missing since about 10:30 a.m. Tuesday. Police were on the lookout for the woman and her red Honda Accord last night and today until the crash was reported. Red Honda Civic discovered at location of the green arrow (approximate location).